Deliver world-class localized content to support your global sales and marketing efforts with software trusted by over 250,000 translation professionals worldwide. Localize greater volumes of content and assets by leveraging software that provides access to translation memories, terminology and self-learning machine translation capabilities. Achieve consistent brand, tone of voice and content quality across all languages and translation projects with easy-to-use dictionaries, glossaries and built-in quality controls. Reduce the time required to complete translation projects with smart project management and collaboration features that accelerate all areas of your projects. Easily reuse previously translated and approved content across all of your projects with intelligent translation memory (TM) technology. Increase translator productivity by as much as 80% and improve consistency across your content. Protect your brand values and ensure a consistent tone of voice across all languages. Users can create and share approved terminology across the organization, ensuring that correct terms are applied to every translation. SDL MultiTerm is the terminology management solution available across the entire SDL Language Platform that can be seamlessly integrated with SDL Trados Studio. Access your glossaries 24/7 as SDL's MultiTerm technology lies at the heart of the entire SDL Language Platform, whatever solution you choose. Connect to MultiTerm glossaries in a number of ways, ensuring your users get the right terminology at the right time and in the most convenient way. Share your termbase across your company, allowing employees to actively contribute towards new term creation. Create and deliver large translation projects quickly and easily across multiple languages with the project management capabilities found in SDL Trados Studio. With the SDL Language Platform, get the necessary flexibility and scalability you need to build your preferred translation supply chain, no matter how complex or far-reaching. Manage all your projects through a Projects view that contains all the necessary information you need to keep on track. Connect SDL Trados Studio to SDL Trados GroupShare, providing additional collaborative and real-time project functionality. Take your project management one step further with SDL WorldServer, designed for large enterprises working with complicated translation processes. 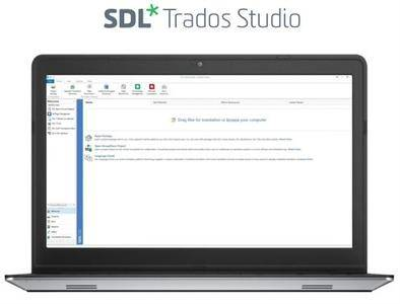 Complete projects faster and double your productivity levels by combining SDL's unique self-learning Machine Translation technology with SDL Trados Studio. Powered by SDL Language Cloud, AdaptiveMT can be incorporated into existing translation workflows, making it easy to increase productivity while preserving quality. Secure, self-learning MT that produces instant, high-quality suggestions that adapt to the style of the translator in real time. Get instant access to pre-trained MT engines in the Cloud offering industry-specific, high-quality suggestions. Use SDL Trados Studio's unique machine translation AutoSuggest functionality and receive sub-segment MT matches. Tailor every area of your SDL Language Platform thanks to our flexible underlying architecture. Users can integrate SDL Trados Studio with their own business applications, leverage out-of-the-box integration capabilities between SDL Trados Studio and the entire SDL language technology offering, or use third-party applications in the dedicated SDL AppStore. Enable your team to work together seamlessly on every project. SDL Trados GroupShare empowers teams using SDL Trados Studio to securely share centralized translation memories, terminology and projects. Benefiting from real-time concurrent access and instant live updates, GroupShare can dramatically improve productivity, consistency and streamline project management. - SDL Trados Studio 2019 supports Microsoft Windows 7, Windows 8.1 and Windows 10. - As a minimum requirement, we recommend an Intel or compatible CPU-based computer with 4 GB RAM and a screen resolution of 1024x768. - For optimum performance, we recommend a 64-bit operating system, 16 GB RAM, an SSD drive and a recent Intel or compatible CPU. Full support for 4K hi-resolution screens is planned and will be implemented incrementally in future releases. Bütün Zaman Ayarları WEZ +3 olarak düzenlenmiştir. Şu Anki Saat: 22:09 .